Red box mod vape beside e-juice bottles; image by Antonin FELS, via Unsplash.com. In matters of science as with matters of law, it’s never a good idea to rely solely on sources with a vested interest in the outcome or other bias. For example, take the relative dangers of vaping electronic cigarettes. Most of the research I’ve looked at suggests that e-cigarettes seem safer than traditional cigarettes, even when they contain nicotine. Then a journalist friend re-posted an article warning that vaping can lead to something called “popcorn lung”. More scientifically known as bronchiolitis obliterans or constrictive bronchiolitis, popcorn lung was a name given to the condition because it was first observed among workers in a popcorn factory who developed it after inhaling unusual amounts of diacetyl, a chemical that was used for artificial butter flavoring that also is found in some vaping liquids. The condition leads to extreme shortness of breath and is irreversible. E-cigarettes (vaporizers or vaping pens) heat rather than burn, producing fewer carcinogens. E-cigarettes also can be used for vaping other things than tobacco or nicotine such as marijuana, which have even less cancer risk. Still, it wouldn’t be the first or last time a manufacturer had downplayed the risks and exaggerated the benefits of a product, so I decided to check the article. The source of the claim was a site aspiring to be the online equivalent of UK “lad mags” such as Maxim and FHM, a lifestyle source with would-be viral videos, snark, attitude, and click-bait. That doesn’t mean it can’t convey important news, but don’t take it on trust; journalistic integrity is not its raison d’etre. It was based on an article from Insider, (a general news sibling to Business Insider) to which it linked. The original article was much less alarmist, much more skeptical. It pointed out that the “story” had been around for at least two years and had been examined by urban myth and misinformation fact-checking website Snopes. Some flavorings in vaping pods do carry diacetyl—which has been linked to “popcorn lung” in a Harvard study—but there was no link established between the pods themselves and popcorn lung. Traditional cigarettes contain more than 100 times (maybe as much as 750 times) of the problematic chemical than e-cigarettes, but no one has ever been diagnosed with popcorn lung due to smoking alone. Even before the Harvard study was released, e-cigarette companies had themselves disclosed the presence of the chemical. The main reason the Insider was reviving this old story in the first place was that Juul—the largest e-cig company—announced it was voluntarily pulling (at least temporarily) most of its flavored e-liquid pods (except for menthol). So, rather than trying to pull a fast one, the company seems to have been open about a problem that seems if anything less dangerous than tobacco—which does not seem to have ever been raised as a risk for popcorn lung—and was already engaged in taking most of the product off the market until it can be ensured that only those 18 and older can purchase it. Other less scare-mongering critics acknowledge that yes, vaping seems to be safer than smoking—though there is some concern that vaping may get chemicals such as formaldehyde deeper in the lungs even though the amount in e-cigs is less than smoking—but that doesn’t make them safe. There are problems with vaping that have nothing to do with popcorn lung, beginning with nicotine. Vaping tobacco-based products means you are still ingesting nicotine, which is more addictive than heroin. The answer to the question “is nicotine a drug?” is “Yes”. If vaping helps you quit tobacco and smoking altogether, that’s good. If it helps you wean yourself from vaping, too, that’s probably better. The problem is that too many young people seem to be going from vaping to smoking, not the other way ‘round. Some do both: vape in public where smoking isn’t allowed and smoke at home. That could be the worst of both worlds; one report says that this increases the risks of heart attacks five times. To repeat a refrain too often used by people who oppose legalizing something or want to make something illegal, we do need more research. E-cigs have only been in wide use for less than 10 years so far. They may have health risks that far outweigh their benefits. For example, other things than nicotine or tobacco can be vaped, including marijuana. At least one small study has found that vaping marijuana affects users much more intensely than smoking. Is that good or bad though? If it takes less marijuana to get you high, then you probably use less, right? On the other hand, the rise in vaping of tobacco/nicotine and marijuana seems to have had little or no effect on the number of smokers (smoking cigarettes is at a 43-year low, and even smoking marijuana has shown no increase among teens, although it has risen among adults) and coincides with decreases in frequency of binge-drinking, drunkenness, and “misuse of opioids”. 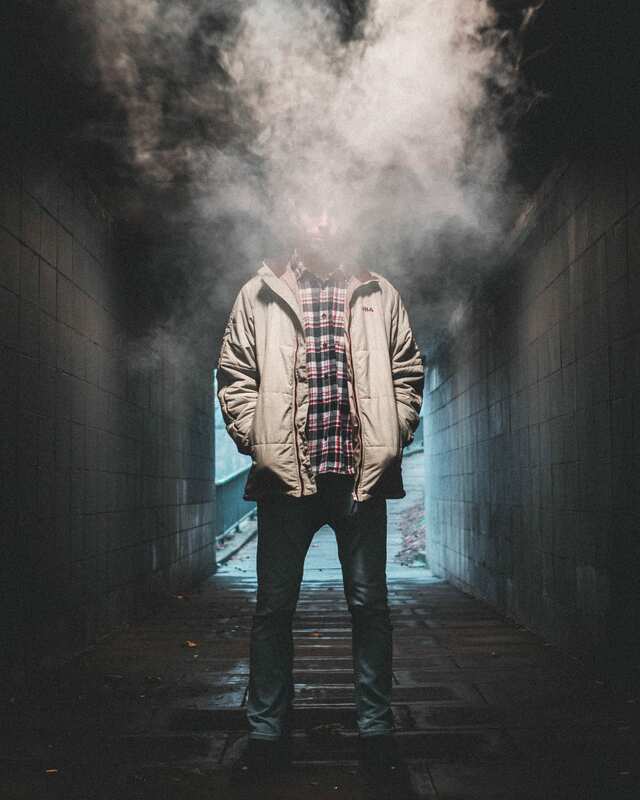 Young man in tunnel, face obscured by smoke; image by Luther Bottrill, via Unsplash.com. One study suggests that the decrease in smoking and other drug use may be due to less peer pressure because people are more likely to “congregate” on devices (phones, computers, tablets) rather than in person. In other words, electronic device addiction may be the answer to drug addiction! E-cigarettes seem to reduce all of these factors. They seem to be less harmful to smokers, their vapor doesn’t spread as far as cigarette smoke, and what vapor there is doesn’t smell like cigarette smoke. The anti-tobacco crowd seems to be engaged in the same kind of misinformation that made young people distrust the government’s position on marijuana and other drugs. A 2008 study found no evidence that anti-marijuana campaigns reduced cannabis use, and it may even have increased it. Vaping is new and shiny (we love technology), fairly discreet (some look like key-chain fobs or hard drives), and probably have fewer health risks than traditional tobacco products. The rise in e-cigarette use—especially by young people—is of concern, but a return to the overblown “This is your brain on drugs” approach may backfire. Let’s find out the real risks and how to solve them before bringing up nonsense like popcorn lung. Stephen Bitsoli, a Michigan-based freelancer, writes about addiction, politics and related matters for several blogs. A lifelong avid reader, he loves learning and sharing what he's learned.